This summer, MPavilion located in Melbourne’s Queen Victoria Gardens plays host to a variety of events that see music and culture collide. Melbourne’s diverse music identity is on display in the program with all events free and taking place at the internationally celebrated architectural pavilion designed by Carme Pinós of Barcelona’s Estudio Carme Pinós. The music lineup is a great excuse to visit the pavilion in the warmer weather with a variety of genres, artists and collaborators taking part in events suited to people of all ages. Below is MPavilion’s music highlights. The artists of SA the Collective create their own soundscapes, exploring all possibilities not bound by time or culture. Their music is a culmination of their Chinese roots, innovative process and sonic exploration. Coming to Melbourne from Singapore as part of Mapping Melbourne 2018, this incredibly special event at MPavilion will be SA the Collective’s only live performance and an occasion not to be missed. The esteemed quintet formed in 2017 at the Australian National Academy of Music (ANAM) and feature Fletcher Cox, Michael Olsen (trumpet), Aidan Gabriels (horn), Jackson Bankovic (trombone) and Jason Catchpowle (tuba). Bring a picnic rug or relax on MPavilion’s tiered seating and have a midday break with this hour-long performance. Australia’s much-loved independent record label presents cross-cultural collaborations from artists who call Melbourne home. In this instalment, classically trained Chinese Australian composer Mindy Meng Wang joins dream-pop singer-songwriter Sui Zhen for a performance not to be missed. Celebrate the festive season with a day of Spanish flair for the whole family, featuring flamenco music and dance performances, plus an open flamenco dance workshop at 3pm with the Flamenco Fiesta Group. The workshop is open to people of all ages and abilities, so get your dancing shoes on! The MPavilion kiosk will be serving sangria as well as boutique drinks thanks to Four Pillars Gin, Shadowfax wines and Two Birds Brewing. Polito x Visual Display is a collaboration between electronic music duo Robert Downie and Finnian Langham (Polito) and performers Arabella Frahn-Starkie and Hillary Goldsmith (Visual Display). Both parties engage with improvisational scores, responding to each other and their varied surroundings. The outcome is a mesmerising audiovisual landscape. Rock Academy is a school holiday program that helps develop the skills of teen musicians. Forming bands, they are given guidance by some of Australia’s leading professional musicians, though not a class-based program; they spend all their time rocking at one of Australia’s premier studios: Bakehouse Studios in Richmond. This year, Rock Academy bands are preparing cover songs and co-writing original songs to be performed in front of family and friends at a final performance at MPavilion 2018. They definitely get loud! A multi-generational sound system party for kids and their adults, this vibrant outdoor dance-off draws its inspiration from city block parties in Latin America and the Caribbean. With young local DJs providing the soundtrack, this is perfect summer entertainment for kids who like to bust a move. Pack a picnic and enjoy coffee and refreshments from our Kiosk. Establishing herself through collaborations with Deborah Cheetham’s Short Black Opera as well as Jessie Lloyd’s Mission Songs Project, Jessica Hitchcock will perform from her very first EP, due to be released in May 2019. MPavilion is Australia’s leading architectural commission and design event conceived and created by the Naomi Milgrom Foundation. 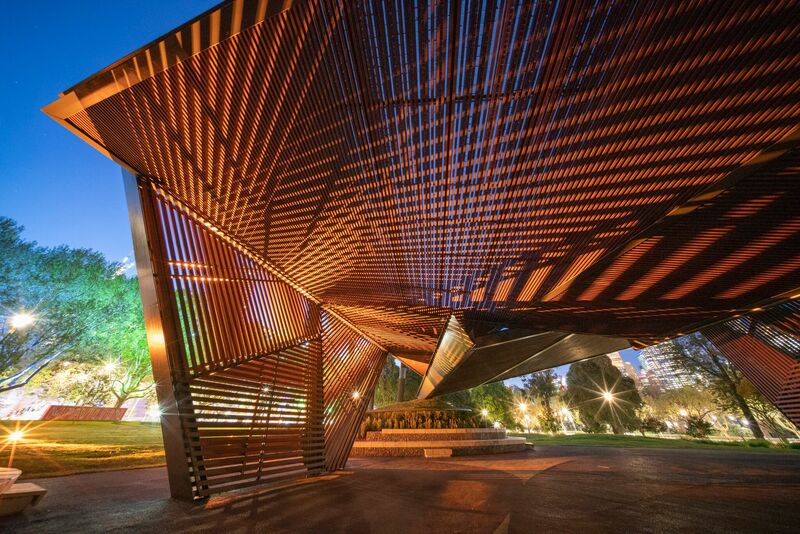 Every year one new temporary pavilion, designed by a leading international architect, is erected in Melbourne’s historic Queen Victoria Gardens. From October through February, the MPavilion becomes a design and cultural laboratory, and home to a series of talks, workshops, performances and installations. The Naomi Milgrom Foundation was founded in 2014, and its purpose is to enrich Australian cultural life by engaging new audiences with exceptional art, design and architecture. The Foundation, led by Naomi Milgrom AO, has become a model for public-private collaboration by enabling new projects with a focus on public, industry and education components.